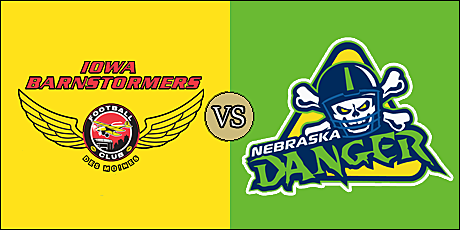 What: The defending champion Barnstormers ride into Grand Island to meet the Danger. When: Saturday, March 23 at 5:05 p.m. pacific (7:05 p.m. central). Where: Eihusen Events Center; Grand Island, Nebraska. 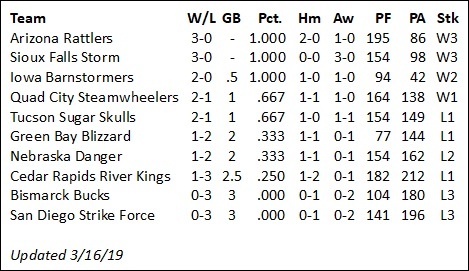 2019 Head to Head: June 15 - Danger at Barnstormers. Note: These teams met in in the United Conference Championship last season, with the Barnstormers winning, 48-17. The Barnstormers are 2-0 overall and 1-0 on the road. They are coming off a 41-3 home win over the Green Bay Blizzard on March 9. The Danger are 1-2 overall and 1-1 at home. They are coming off a 55-36 home loss to the Sioux Falls Storm on March 9. The Barnstormers picked up right where they left off from their 2018 championship campaign. There are some new faces but, so far the results have been the same. Iowa is the only team to have had bye weeks in two of the first four weeks of the season. A convincing road win over the Quad City Steamwheelers was only more accentuated with a decisive week 3 romp of the northern rival Green Bay Blizzard. The 41-3 win accounted for the lowest scoring output for the Blizzard in their history. The Barnstormers look sharp coming out of the gate and will look to stay undefeated as they face the Danger. Nebraska looked great in their season opener at home against the Bismarck Bucks, and were competitive against the Blizzard in week 2 before losing on a last-minute touchdown. 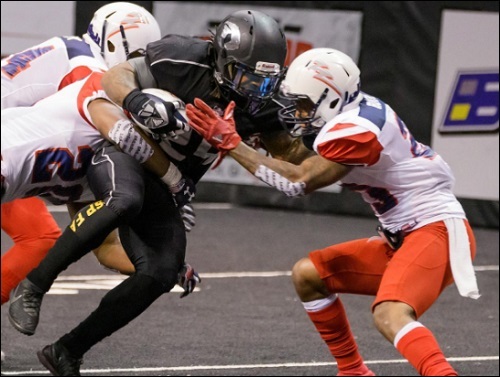 They fell at home to the Sioux Falls Storm, 55-36, before having a bye last week. These teams met in last season's United Conference Championship Game with Iowa coming out on top, 48-17, and advancing to the United Bowl. Daquan Neal has proved to be a capable replacement for Drew Powell as he comes in with a 79.4 completion percentage and 155.5 passing yards per game. In just two contests, He's tossed nine touchdowns and zero interceptions. Neal is a dual threat quarterback. Averaging 4.1 yards per carry, he has rushed 18 times for 73 yards and a touchdown. Jamal Tyler, who scored the winning touchdown in last season's United Bowl, has 16 carries for 56 yards and two scores. 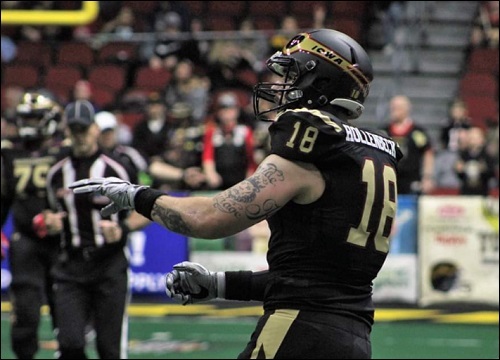 Ryan Balentine, the IFL's all-time leader in receiving yards, has 14 receptions for 172 yards and four touchdowns through two game. Former Cedar Rapids Titan Connor Hollenbeck has added seven catches for 95 yards and to touchdowns, and former Spokane Empire wideout Samuel Charles has hauled in a pair of touchdown passes. Even though the Barnstormers lost some defenders from last season's team, they still have a talented group, especially at defensive back where four players have recorded double-digit total tackles on the season. Jourdan Wickliffe leads the group, with 17 tackles, an interception and two forced fumbles. Jajuan Harley had 12 tackles and a sack, while Tyrell Pearson also has an interception. Nathan Criswell has made seven of 12 extra point attempts and one of two field goal tries. At this early point in the season, the Danger feel like a conundrum. They have talent and some good offensive numbers, but have been unable to produce a win since week 1. Pig Brown's group is coming off their first bye of the season. Tommy Armstrong, Jr. lines up under center and has completed 63.5 percent of his passes for 381 yards with seven touchdowns and two interceptions. He also is averaging 41.7 rushing yards per game. Davonte Sapp-Lynch is fourth in the IFL with 47.3 rushing yards per game. Armstrong and Sapp-Lynch are amongst three players tied for second in the league with six rushing touchdowns apiece. Gregory Dent, Jr. has nine catches for 109 yards and three touchdowns, and Eric Thomas adds eight receptions for 76 yards and two scores. Linebacker La'More Wise's 17 total tackles lead Nebraska's defense. In all, seven players have recorded double-digit tackles through the team's three games. Defensive backs Jason Baxter and Lavaious Varnado each have each picked off opposing quarterbacks' passes. Defensive lineman Charles Walker has the Danger's only full sack of the season. The Danger released kicker Jerod Haynes on March 12 and, as of the writing of this preview, have not officially signed a replacement. March 22 - Quad City Steamwheelers at Sioux Falls Storm, 5:05 p.m.
March 23 - Iowa Barnstormers at Nebraska Danger, 5:05 p.m.
March 24 - Green Bay Blizzard at San Diego Strike Force, 3:05 p.m.
Kickoff will be in about 15 minutes. I hope this game is close, but something tells me it's going to be a Barnstormers' blowout. The youtube feed is waiting for the IFL. What's up with the video stream? Oh, the IFL is lagging. Touchdown Barnstormers. Jamal Tyler 6 yard run. Nathan Criswell kick. Touchdown Danger. Quincy Walden 14 yard pass from Tommy Armstrong. Renaud Labrecque kick. Touchdown Barnstormers. Ryan Balentine 8 yard pass from Daquan Neal. Nathan Criswell kick. Not to sound like a girly girl, but I like the Danger's lime green jerseys against the black turf. What a terrific scramble by Armstrong! Technical difficulties in the replay booth. Touchdown Danger. Tommy Armstrong 1 yard run. Renaud Labrecque kick.